Today is World Wetlands Day (02 February), and a timely reminder of how paramount wetlands conservation is in our fight against climate change and the risk of natural disasters. Across the UK and in our Overseas Territories, the government has designated 175 sites under the Ramsar Convention covering more than a million hectares (ha). These sites provide vital habitat for biodiversity and boost our planet’s natural resilience against natural disasters and climate change. You can read more about Natural England’s work on peatland restoration on the Natural England blog. World Wetlands Day is a great opportunity to celebrate wetlands and the vital ecosystems they provide which benefit us all. I’ve seen how mangroves provide flood protection and also livelihoods, such as fishing and bee keeping, helping to transform the people’s lives. Through naturally forming peat, wetlands and our blanket bog in the UK are one important tool in the fight against climate change. Peatlands, mangroves, and seagrass store vast amounts of carbon. Peatlands cover about 3 per cent of our planet’s land and store approximately 30 per cent of all land based carbon – twice the amount than all the world’s forests combined. Wetlands are the most effective carbon sinks on Earth. Coastal wetlands such as salt marshes, mangroves, seagrass beds, and coral reefs act like shock absorbers. They reduce the intensity of waves, storm surges, and tsunamis, shielding the 60 per cent of the global population who lives and works along coastlines from flooding, property damage and loss of life. In 2016, the UK government funded the establishment of the ‘Blue Forests’ initiative run by British organisation, Blue Ventures. The aim of the project is to reduce deforestation of mangroves habitat, create new sustainable livelihoods, support community health and women’s empowerment and increase climate resilience in coastal communities. When drained or burned for agriculture (as wetlands often are) they go from being a carbon sink to a carbon source, releasing into the atmosphere centuries of stored carbon. CO2 emissions from drained and burned peatlands equate to 10 per cent of all annual fossil fuel emissions. In May 2018, £10m of government money was given to help restore more than 10,000 football pitches-worth of England’s iconic peatlands. Four local partnership projects are reducing greenhouse gas emissions from making their way into the atmosphere by creating a natural store for carbon. This vital work will abate and store an estimated 23,000 tonnes of carbon per year contributing to the UK’s climate change goals. The South West Peatlands Bid led by South West Water is being delivered through local partnerships. The focus is on upland peat across Bodmin Moor, Dartmoor and Exmoor. So far 188 ha of peatland has been worked on. 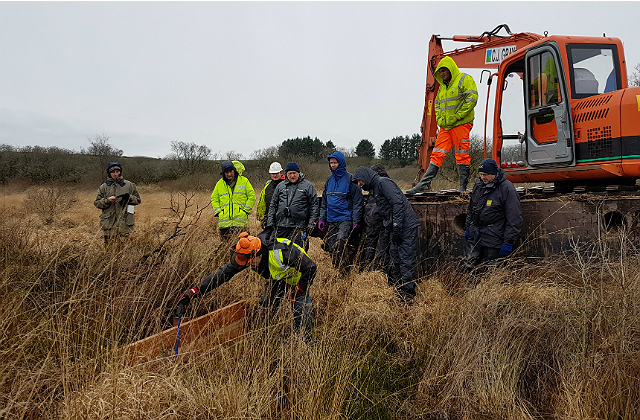 A huge effort has been put in by South West Water and the ‘South West Peatland Partnership’ partners enabling practical works to begin to restore 1,680 hectares of damaged peatland on Bodmin Moor, Dartmoor and Exmoor. On Dartmoor unexploded ordnance surveys are taking place so that the sites can be deemed ‘clear’ to work on. On Bodmin Moor an amphibious 16-tonne specialist digger had to be brought in to work on this valley mire in a reclaimed china clays works. The site is already known for breeding snipe and curlew, but the work will create further suitable habitats not only for these birds but other species such as dragonflies and the all-important peat-forming Sphagnum mosses. The team on Exmoor have been collaborating with private landowners and do these works start the process of peatland restoration and locking up carbon, but they also prevent further soil loss and improve water quality entering the river, which was a real concern for the farmer. All the efforts put in by a whole raft of people and organisations and the funding from DEFRA is enabling the South West to protect its precious peatlands and contribute to the local and global need for action on climate change. Moors for the Future Partnership has been working for 15 years to reverse the damage caused by 250 years of industrial pollution and wildfire on blanket bog in the South Pennines. The work taking place this season on Moor Carbon is one of many projects Moors for the Future Partnership is working on. Since just August 2018, the Partnership has planted over 600,000 sphagnum moss plug plants across 540 hectares, installed 3,000 gully blocks, and airlifted and spread 10,000 bags of heather brash. The Moor Carbon project is a hugely important piece in the jigsaw of protecting South Pennine peatlands. One of our Moor Carbon sites was affected by the 2018 Tameside summer wildfires. Thanks to the Peatland Restoration Fund, we are spreading heather brash to stabilise and re-vegetate 20 hectares of bare and eroding peat that were present before the fires. So far we have airlifted and spread 4,400 bags of heather brash out of 5,500 to be spread this winter. As a continuation of the revegetation started by the brash, these 20 hectares will be ready to receive lime, seed and fertiliser treatment in the spring. Meres & Mosses Carbon Capture Project led by Shropshire Wildlife Trust aims to restore a mix of nine lowland and upland peatland sites covering 98 ha across the Meres & Mosses Natural Area. Since April 2018 work to restore blanket bogs has abated more than 350 tonnes of carbon. The Mosses of north Shropshire need be wet to provide a home for wildlife and to lock up trapped carbon. This project is returning them to their true soggy and boggy nature. The North of England peat partnership, led by Yorkshire Wildlife Trust, is restoring 21 peatland sites across 6 counties in the north of England – County Durham, Cumbria, Lancashire, North Yorkshire, Northumberland and South Yorkshire. It’s been a busy year for the all of the organisations involved. Work is underway on 394 hectares of lowland raised bog at two sites in South Yorkshire and Lancashire, in the uplands, we’ve been preparing restoration plans for 1,679 hectares of blanket bog. No two bogs are the same, so each of those 19 sites needs a tailored plan. We’re all looking forward to putting those plans into action on the ground. Today the Guardian reports on leaked Environment Agency emails looking at potential outcomes if we leave the EU without a deal. The article suggests that in the event of a no-deal, export licences for millions of tonnes of waste will become invalid overnight, leading to stockpiling and secondary pollution. There is already a process in place to ensure the continuity of notified waste shipments in the case of a no-deal Brexit, which was set out by the European Commission in November. We have received agreement to roll over 98% of existing consents for waste exports to the EU from the UK - agreeing 545 out of the 556 current approvals. We expect to reach agreement on the outstanding approvals and we are confident that a no-deal Brexit will not have a significant impact on the continued export of the UK’s notified waste shipments that have already been agreed.